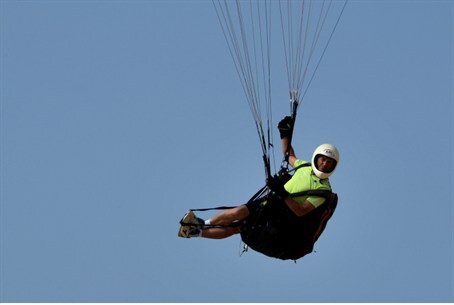 Shin Bet: apprehended Hamas leader reveals elaborate plot for abduction, including paragliding training. Israeli security forces have captured a senior Hamas commander in the city of Khan Younis in the Gaza Strip - and in doing so thwarted a creative plan to infiltrate Israel to commit a terrorist attack. The terrorist - said to be a member of an elite commando unit within Hamas's "military wing", the Ezzadine Al Kassam Brigades - was interrogated by the Shabak (Israel Security Agency), and confessed to having been sent to Malaysia to gain paragliding training, which he was to use to infiltrate into southern Israel to carry out an attack - potentially a kidnapping - in the event of an Israeli operation like the one launched 23 days ago. The terrorists also told interrogators that he had coordinated anti-tank ambushes and set up sniper positions against IDF forces during Operation Protective Edge. The sniper positions were placed in the tenth floor of the Red Cross building in Khan Younis, in line with Hamas's doctrine of using sensitive civilian buildings as military posts to make it more difficult for Israel to strike them without incurring civilian casualties. The terrorist was enlisted into Hamas in 2007, and underwent basic combat training; in 2013 he was recruited to an "advanced" commando unit of Ezzadine al-Kassam, in which he was drilled in the use of a wide variety weapons including pistols, M-16 and AK-47 assault rifles, RPGs, PKC heavy machine guns, and locally-produced hand grenades. "Most intriguing of all, however, is that Hamas has been actively planning "high-quality," unique, and significant forms of terror against Israelis - such as infiltration through paragliding - all while receiving assistance and training in other countries (in this case, Malaysia)."